Up for grabs is this remastered CD by John Coltrane. On the Atlantic label, the catalogue number is81227 3699-2 and the date of issue is 2000. Rock & Roll / Rockabilly. Soul / Dance / Rap / Reggae / Ska. TRANE: THE ATLANTIC COLLECTION. JOHN COLTRANE. 100% ORIGINAL PRODUCT. Equinox (Remastered). Central Park West (Remastered). 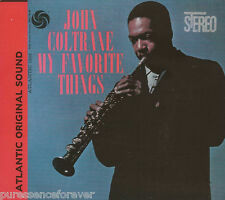 JOHN COLTRANE - MY FAVORITE THINGS (1998 Remastered CD Album). Originally released in 1961 and presented here in digitally remastered format with original artwork. In excellent condition with just a few very light marks. Remastered version of Coleman 's 1959 album. Featuring Don Cherry on cornet, Charlie Haden on bass and Billy Higgins on drums. Disc: NEAR MINT. Disc graphics are clean bright and bold. No scuffs or scratches. ORGANISATION (GMFA). THE DONATION YOU ARE MAKING TO THE. OTTO TITSLING. Label: ATLANTIC. Year: 1999. Format: CD. Ornette Coleman. EU 2013 ISSUE CD FOR JAPANESE MARKET. 2013 EU ISSUE 24bit REMASTERED CD! DISC IN NEW CONDITION, PERFECT PLAYBACK. MODERN JAZZ QUARTET – PORGY AND BESS. INSERT: EXCELLENT. CD: A COUPLE OF VERY LIGHT MARKS – REALLY CLEAN. Lonely Woman. Record Label: Warner Jazz. New York 19. 1 – CD £1.29, 2. nd CD £1.00 then 3 – 16 CDs for £3.50. 17 – 50 CDs for £5.00 Still no increase, 3 years in a row. As always, we are here to help, feel free to ask about anything that you are unsure about. 8 Boa Palavra (The Good Word) 3:08. 1 My Favorite Things 2:52. 10 So What's New 3:01. 4 Veleiro (The Sailboat) 3:21. 3 Ponteio 2:26. Liner Notes – William B. Williams. Guitar – John Pisano. THE CHARLES LLOYD QUARTET Dream Weaver. Dream Weaver. 2b Dervish Dance 8:24. Up for grabs is this remastered CD by Herbie Mann. On the Atlantic label, the catalogue number is 79571-8. NEW, UNPLAYED AND STILL SEALED. Deus Xango. Sales Policies. MIROSLAV VITOUS / INFINITE SEARCH. 24bit REMASTERED. Infinite Search. 2013 ISSUE 24bit REMASTERED CD! 2013 ISSUE CD FOR JAPANESE MARKET. DISC IN NEW CONDITION, PERFECT PLAYBACK. MADE IN THE EU. Up for grabs is this remastered CD by Herbie Mann. On the Atlantic label, the catalogue number is 79576-3. This Dream. Feeling Good. Who Can I Turn To?. NEW, UNPLAYED AND STILL SEALED. Look At That Face. RAHSAAN ROLAND KIRK. 24bit REMASTERED. 2013 ISSUE 24bit REMASTERED CD! OTHER FOLKS MUSIC (1976). 2013 ISSUE CD FOR JAPANESE MARKET. DISC IN NEW CONDITION, PERFECT PLAYBACK. Up for grabs is this remastered CD by Charles Lloyd. On the Atlantic label, the catalogue number is 79641-7. Sombrero Sam - Charles Lloyd Quartet. NEW, UNPLAYED AND STILL SEALED. Voice In The Night (at the Town Hall, New York City, November, 1968). THE ORNETTE COLEMAN QUARTET Ornette! CD Album REMASTERED . 2003 UK remastered edition of Coleman 's 1961 self-titled album. Case: EX . Original jewel case. Clean and shiny. Under bright light shows very minimal light marks. WALK IN LOVE. THE DONATION YOU ARE MAKING TO THE. IT'S NOT THE SPOTLIGHT. ORGANISATION (GMFA). SINGLE GIRL. The albums are in mini-sleeve format with original liner notes. There is nothing to add to the production except to say the recordings are well-recorded and presented by a man with plenty to say, be it blues or chase the chords.The rhythm sections are, of course, faultless with complete understanding of where the playing direction is moving. Title: Layin' in the Cut. Attributes: Japan - Import. Format: CD. Japanese CD pressing. 2002 sealed UK/German CD with 3 bonus tracks presented in a digipak sleeve. Artist: Charles Mingus. Title: Clown (remastered). Attributes: Manufactured On Demand. Format: CD. Release Date: 1999. Condition: New. Coltrane, John - Cousin Mary (LP Version) 5:49. Coltrane, John - Countdown (LP Version) 2:25. Coltrane, John - Spiral (LP Version) 6:02. Coltrane, John - Syeeda's song flute (LP Version) 7:05. Coltrane, John - Naima (LP Version) 4:25. Blues In B Flat. Blues In a Minor. Blues In C Minor. Blues In H (B). Rise Up In the Morning. Billy Cobham - Spectrum 2001 Atlantic Masters with Bonus Track in Mint Condition. Securely dispatched in cardboard CD mailer with Royal Mail 2nd Class. If you purchase more than one CD please contact me after the auction and I'll refund any excess postage charges. Artist: Billy Cobham. Attributes: Remastered. Title: Spectrum. 3 Spectrum. Released: 2001. Grading codes: M (Mint/New), NM (Near Mint), VG (Very Good Plus), VG (Very Good), G (Good Plus), G (Good), F (Fair), P (Poor). 9351 PP LEEK. THE NETHERLANDS. LANDAUERLAAN 36. Digitally remastered edition of the mono pressing of this 1960 album by the jazz great. Initial sessions for this album, the second recording date for Coltrane under his new contract after a January 15 date led by Milt Jackson, took place on March 26, 1959. We will not be held responsible for these variations. ~ Matt Collar. John Coltrane - My Favorite Things, Pt. John Coltrane - Like Sonny 5:51. John Coltrane - Cousin Mary 5:49. John Coltrane - Central Park West 4:16. John Coltrane - Equinox 8:38. John Coltrane - Naima 4:25. 1 WORD FROM BIRD / Teddy Charles. 2 LAURA / Teddy Charles. 4 WHEN YOUR LOVER HAS GONE / Teddy Charles. 5 JUST ONE OF THOSE THINGS / Teddy Charles. 6 BLUE GREENS / Teddy Charles. WORD FROM BIRD. ArtistTEDDY CHARLES. 1 MR. BLUES / Hank Crawford. 3 HUSH PUPPIES / Hank Crawford. 6 LONELY AVENUE / Hank Crawford. 8 SMOKY CITY / Hank Crawford. 9 THE TURFER / Hank Crawford. HANK CRAWFORD-MR. BLUES-JAPAN CD Ltd/Ed. Japan CD Limited Release. A QUARTET IS A QUARTET IS A QUARTET. ArtistTHE MODERN JAZZ QUARTET. 1 REUNION BLUES / The Modern Jazz Quartet. 2 WINTER TALE / The Modern Jazz Quartet. 3 CONCORDE / The Modern Jazz Quartet. JAPAN CD LIMITED RELEASE. History will undoubtedly enshrine this disc as a watershed the likes of which may never truly be appreciated. Coltrane (tenor sax) is flanked by essentially two different trios. At the heart of these recordings, however, is the laser-beam focus of Coltrane's tenor solos. Herbie Mann - New Orleans 2:07. Herbie Mann - Hold On, I'm Comin' 8:56. Herbie Mann has always been open to new trends in his music. I'm Comin'," and "Chain of Fools," is rather weak. ~ Scott Yanow. Live At Maisonette. Japan CD Limited Release. Warner Music Japan. 3~5 MINI LP CD. hard to find records and new Japan cds. Our specialized fields are in rare Japan. We promise to work hard on. happens or we make a mistake. ArtistSARAH VAUGHAN. SONGS OF THE BEATLES. JAPAN CD LIMITED RELEASE. WARNER MUSIC JAPAN. Our specialized fields are in rare Japan. hard to find records and new Japan cds. 3~5 MINI LP CD. Number of Discs. 1 IN TANGIER / PARADISE BEACH / Herbie Mann. 2 FLYING / Herbie Mann. 3 DON'T YOU KNOW THE WAY (HOW I FEEL ABOUT YOU) / Herbie Mann. 4 MISS FREE SPIRIT / Herbie Mann. 5 WALTZ FOR MY SON / Herbie Mann. 6 PENDULUM / Herbie Mann. 1 FIRST TAKE / The Ornette Coleman Double Quartet. 2 LITTLE SYMPHONY / Ornette Coleman. 3 MONK AND THE NUN / Ornette Coleman. 4 CHECK UP / Ornette Coleman. 5 JOY OF A TOY / Ornette Coleman. ArtistOrnette Coleman. Closer to the Source. You're No. 1-in My Book. About Movie Mars.